What was JB's first artistic experience? What is a typical day in the life of JB, writer/artist? What pencils does JB use? What tools does JB when inking? What drawing board does JB use? What scanner does JB use? How does JB lay out the page-to-page events of an issue? How does JB draw those amazing perspectives? What 3D modeling program does JB use? And how does he use it? Does JB use computer models so he can save time? What advice does JB have for aspiring artists? How did JB achieve the shading technique used in his '90s books? What is the "dry brush" technique JB sometimes uses? How did JB create the font he uses to letter his books? Where can I buy original art by JB? How can I commission an art piece from JB? Do your recall who was the FIRST artist who "grabbed" you and got you going on drawing? Perhaps when you were a child? JB: Your question has a much more literal answer than you might have guessed when you posed it. There have been many influences in my artistic career, but the one who I will always credit as having jumpstarted the whole thing was my paternal grandfather, Frederick Aurthur Byrne, who, when I was a baby, would hold me on his lap, hold a piece of chalk in my right hand, and draw on a small slate. 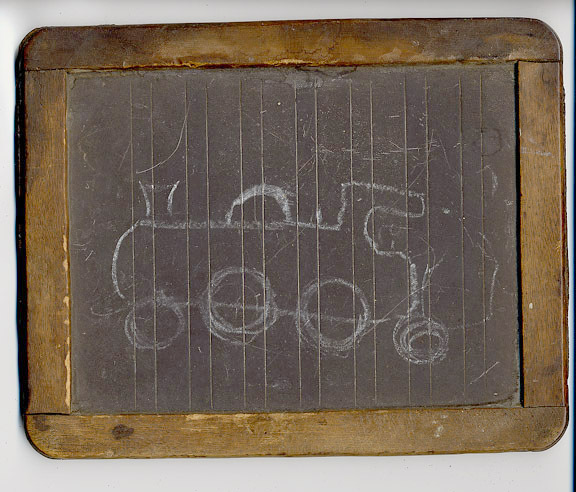 I still have the slate, recovered from my grandmother's house when she died. On it is a choo-choo train which she preserved and which, given the damp English climate, has eaten into the board to the point that it cannot be erased. The oldest existing John Byrne original, vintage 1952!! JB: Start work around 7am. Break for an hour at noon. Afternoon is from 1 to 4, typically. 7 days a week, unless I have something else to do on the weekend. JB: Mechanical pencil with an HB lead. I've read on the web that John sometimes used felt tips for his FF inking. Is this correct? What scanner do you use (for the full pages), and are you happy with it? I was curious about how much you choreograph / lay out events and action in each issue. 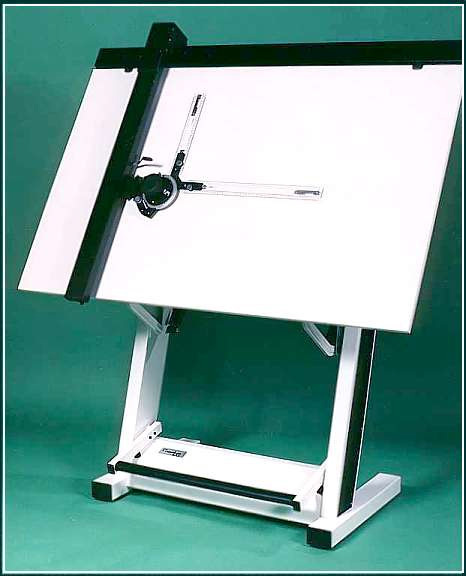 JB: I have an achitect's drafting machine mounted on my board. This is typically used, in the trade for which it was intended, to rule parallel lines. However, the straight edges rotate on a hub, with makes them ideal for drawing perspective grids. I usually lay a grid into most panels, even those that are figures without backgrounds. 3 point perspective, usually. I remember in an earlier post you used a 3D illustration program to work out some perspective issues in a drawing. What program do you use? Do you see yourself expanding its use to buildings, vehicles or other elements? It takes 40 hours to complete a single 3D model? I didn't suspect that using computer for drawing could be so hard. JB: Not so much "hard" -- I wouldn't do it if it was hard! -- as time consuming. Working out the shapes, creating the maps appropriate to those shapes --- it eats up the hours. JB: Someone once said that everybody has 10,000 bad drawings in them, so what every artist has to do is draw and draw and draw and draw and draw and draw and draw until those 10,000 bad drawings are all gone. I loved the shading technique you used in OMAC and some issues of NAMOR, and was wondering if you could go a little bit into the process behind it. JB: DuoShade and Craftint are -- or were -- the trade names of a kind of board some artists used for creating grey tones in their work. The boards were imprinted with line or dot screens, in non-repro blue, which became visible when a special chemical was applied. One chemical would bring out one of the line or dot screens, the second would bring out the other, so that two shades of grey could be created. Skilled artists, such as Wally Wood, managed to create the illusion that there were more shades than that. The chemicals could be applied with pen, brush, or any other tool the artist might choose. The downside of these boards was that the chemicals that brought out the line screen were a kind of photographic process, so if the artwork was exposed to light the line would continue to "develop", growing darker and darker. Even the areas not treated with the chemicals would darken eventually. Could you give a quick run-down on how you created your font? JB: The one I currently use in all my books is based on Jack Morelli's lettering. Knowing that I had been experimenting with hand-lettering fonts, Jack asked me what I would charge to make one for him, of his own lettering. I said "I get to use it." So Jack lettered up an alphabet, including all punctuation and special keys (like those little three line bursts that kinda look like > and <), and I scanned them into my computer. Then, using a low-end font maker called FONTastic, I dropped each letter into the appropriate "slot", fiddled the kerning, fiddled the leading, and created those option keys I mentioned above. That done, I imported the whole thing to FONTographer, which tidied up all the pixellation and created the different sizes. Whole process (excluding Jack lettering the alphabet) takes about an hour and a half. JB: Jim Warden, at DOA (Distinctive Original Art), is my dealer.